The 9818 Change Parts hold an unseamed end in place as it is being pressurized. The 9818 consists of an end holder base with a molded synthetic gasket on which the free end rests, a clamping ring which is placed on top of the end and a pair of jaws which clamp the sample between the clamping ring and end holder during testing. The 9818 is also available with a clamping ring that restrains the counter-sink area and prevents the end from buckling, necessary for the testing of Tab Blow-out or Vent failures. The 9818 is ordered by specifying 9818 and supplying several samples to Altek. Samples MUST be provided to ensure proper manufacture of the 9818 Change Parts. Detail Drawings are also helpful. 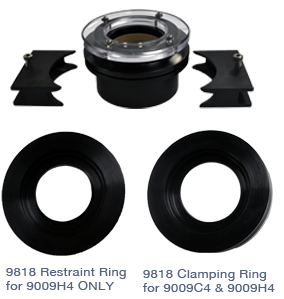 This change part is used with ALTEK Models: 9009C4 ; 9009C4F ; and 9009H4.